The next meeting of the group will be on Thursday May 2nd. We shall be going to Touchstones in Rochdale to visit the exhibition ‘Harry Meadley: But what if we tried’. The exhibition is a response to the challenge to display as much of the borough’s collection as possible in a single exhibition. 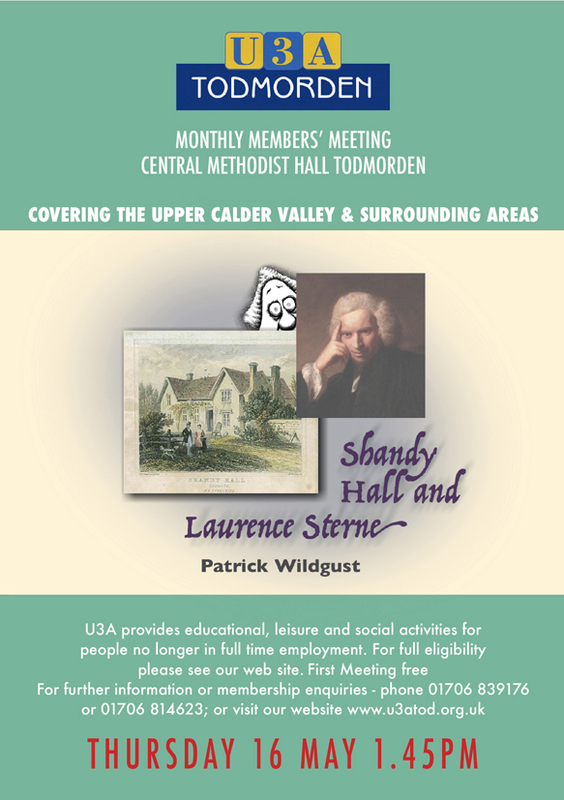 Our next meeting takes place on Tuesday, 23rd April, 2019, at 11 am – 1 pm at the Fielden Centre, Todmorden. We will be preparing for our next Project entitled ‘Climate’. We will begin with an exploration of colour theory and, in particular, complementary colours making use of the colour wheel. We meet on alternate Tuesdays and there are still places available. The greek beginners class meets from 11:00 to 12:00 although it often finishes later. The current sessions are fortnightly in the Saltonstal room in the Town Hall at Hebden bridge and will be running until the first week of May when we will have our summer break. Our next meeting will take place on Monday, 13th May, 2019 at the Polished Knob, Todmorden. We gather on the ground floor to the left of the entrance. All members are welcome. If anyone has a friend or relative In a care home or similar and would like us to entertain, if it is in reasonable range, please contact Rita We are looking forward to another 10 years of fun. No new information. After over a year working on the 10th anniversary textile alongside it’s regular activities craft group will be returning to ‘normal’ after the unveiling on April 18th. At the next meeting on Friday April 26th at 10.30 at The Fielden Centre we shall be again decorating silk scarves. The following meeting on May 10th will be devoted to knitting roses and making wreaths with them. French conversation takes place every fortnight in the Fire Station Community Road on Mondays at 2.00pm. At the moment our numbers are at the maximum so we regret that we cannot take any new participants at the moment. 3 meetings in April as promised so we are now quite experts at Listening & Speaking to our neighbour and reporting back to the rest of the group. We have also watched a video clip in French about South Korea and a French Rap about vowel pronunciation. 3 more new members too, all of whom are very welcome! Back to 2 meetings in May but they will be consecutive weeks (13th & 20th) because of the Bank Holidays. The group also likes to laugh. Many of the laughs they provide themselves, and there’s a wonderful spirit in the group, not just a can-do approach but a want-to-do one. And they’re very capable of designing classes for themselves. All of this, as you can imagine, makes my role relatively easy. No new information. This is a FREE of CHARGE 10 weeks but hopefully new members like the “old” ones will make arrangements to play on and pay Green Fees. Presently books of 20 vouchers are available at £70.00 a book. This means £3.50 for 9 holes, not a bad deal. Books can be shared. The next outing is to Dunham Massey on Tuesday, 14th May. Please contact Linda Cook on 01706 817254 or email landcook@talktalk.net for further information. The April meeting of the Lunch Club took place on Wednesday 10th April at the Stubbing Wharf, Hebden Bridge with 28 members enjoying a convivial meal together. The May meeting will be at the Lake Lounge, Hollingsworth Lake on Wednesday 8th May at 12:30. There are currently 62 Lunch club members and there is no limit to further U3A members joining. There may however be limits for meetings set by the venues chosen so early booking is recommended. We now have 20+ members, and new members, including beginners, are welcome. If you’re interested, please contact Harriet [ha@blurrededges.co.uk ] for more details about how you may join us. We continue to meet on alternate Tuesdays from 10 till 12. With a regular attendance of four we are at present meeting at my house (59, Well Lane, Todmorden). In the warmer months we have been able to meet in Bridgeholme Cricket Club Pavilion, but we’ve opted for comfort during the winter! Members bring their own recordings to share – most of it is what would e thought of as ‘classical’ music, but we interpret that pretty freely. We’d welcome new members, though if we got up to eight we might get a bit short of room. Also it’s impossible to park anywhere close to the house. Ring me on 01706 839115 if you’re thinking of coming along, and I’ll tell you how to get there. Next meeting is Tuesday March 26th. We took a look at ‘The Songlines’ by Bruce Chatwin.This divided opinion again, some of us finding Chatwin unbearably self-centred and cocky, his text disorganised, and his purpose unclear. Others of us weren’t fazed by the writer’s personality and enjoyed the travelogue and the extended meditation on nomadism and the idea of the path in human development. I must say, it is a mish-mash of a book, but I’ve always had an interest in ethno-anthropo stuff, and so I enjoyed the armchair travel and the presentation of a way of interpreting the world that is so different from Western culture’s ‘enlightened’ views. The quality of the writing was rather overlooked amid the discussion based on different strengths of feeling, and the style was very varied anyway because of numerous quotations from texts about nomadic life, walking and the human psyche. I suppose what we were reading might be described as psychogeography. Generally, though, the dialogue and anecdote were given a tick, though the kangaroo hunt had universally shocked us – though maybe that is a compliment to the clarity of Chatwin’s narrative style and the honesty of his own response. We next meet on Wednesday 8th May at 11.00 in Tod Library. This is a unique timing and is a result of avoiding clashes with Philosophy and bank holidays when the Library is closed. We’ll be discussing ‘The Name fo the Rose’ by Umberto Eco. We continue to meet on the second and fourth Monday of each month in the upstairs room at the Stubbing Wharf pub, 1:30 – 3:00. We are continuing to work through our textbook and other examples of Anglo-Saxon literature. Anyone interested in the group should contact Emily for further information. This group is now full…………………..
After a trip to Manchester at the end of March to see an exhibition by Martin Parr we came back to photograph things “At Home”. This was followed by a practical session on how to light portraits using a single light source. At our next meeting we will delve into the world of video while the photo topic will be “Humour”. Unfortunately I missed this month’s meeting, and therefore missed some interesting poems on the theme of ‘cruelty/kindness’. I look forward to reading them. Next month’s meeting will be on 10th May with poems on the theme of ‘music’. What an excellent meeting we had last month with poems on the theme of ‘power’. Subjects included a power station, tractor, snake charmer, interpersonal bonding, and power over vulnerability. Some marvellous poems. This month’s meeting will be on 25th April with poems on the theme of ‘clarity’. We have been trying our hands at watercolours last session, particularly the technique of Wet in Wet. Using fruit or vegetables as our subjects , we tried to reproduce the colours and textures using the loose watercolour technique. Our next session on Good Friday is cancelled , so the next meeting will be on the 3rd of May , when we will be carrying on with watercolours, painting roses or people. There was no April meeting. The group will meet again on May 7th to consider Forensic Psychology. The next Quiz group is on Thursday 25th April at 10.00 at Central Methodist. We cant accept any more members as we have a full quota. Three Valleys Readers met this month to consider This Thing of Darkness by Harry Thompson. A right doorstep of a book which almost all of us read to the end. This is a fictionalized account of Fitzroy, the captain who sailed the Beagle and took Darwen to the south of South America and to the Galapagos Islands. Harry Thompson, who is more well known for satirical news programmes on BBC, but clearly had undertake a vast amount of research to place his story in an what seemed to us all to be a very accurate part of our history. We then discussed how mental ill- health was portrayed, as a thread throughout the book including how the pressure on Captains of ships many hundred of miles away from home in extreme weather conditions. We were all impressed by the detail and apparent accuracy of life at sea and generally in that period of history, including the politics of both Britain and South American countries. So… a really good read and we would recommend. We then made a list of books we would like to read together in our second year and sent it to Calderdale Libraries to batch up for us. We have now seen the first five lectures from the plant science course, and have reached lecture 19 in the great structures course. In the two meetings in the coming month we will learn about the rise of iron- and steel-framed buildings and the story behind America’s “great skyscraper race”. We will also study plant stem functions and hormones that affect leaf growth and shedding. As we are approaching the end of the structures course we are beginning the process of deciding on the next topic. See contact details and information about the group — Please phone for details. We meet every other Friday, as a very friendly group of like minded people, in the Central Methodist room. Usually 8 or 9 of us make up this very friendly group. Anyone welcome to join, but could you please call the Convenor for further details. Between 12 and 15 of us meet to play Scrabble on the first and third Mondays of each month. We have a very welcoming venue at the Golden Lion, Rochdale Road, Todmorden. We have room for new members. anyone wanting to come along can contact me or just turn up on the day. The Social History Group met in March and is continuing to read the Margaret Penn autobiography. We will be discussing Education at our next meeting which will be on May 17. There is no meeting in April as our normal date clashed Good Friday . Sandra Lambshead, Convenor, and Ernie Rogan, On Line Contact. We meet the first Tuesday in the month members are contacted before the next meeting. The group meets on the last Tuesday in each month and group members take it in turn to organise a suitable route. Walks are usually around 4 to 5 miles in length and details of the walk, including starting point, starting time, approximate length and degree of difficulty, are sent out to the group by email a week or so beforehand. We held our March meeting at the Fielding center as usual. We compared three Bordeaux wines. one from Lidl, one out of our bin ends box from Sunday Times wine club, and one extra special one produced by Tony Laithwaite at his own chateau to commemorate his fifty years in the wine trade. Also a South African white. Our next meeting is Friday April 12 at the Fielden Centre, We have not yet decided on our choice of wines. This next meeting is this coming Wednesday 13th February at 2.30 pm to 4 pm at the fire station in Todmorden and topic for discussion is Hungary. Refreshments will be provided.